Miamisburg "State of the City 2019"
MINNEAPOLIS, MINNESOTA,February28, 2019–Miami Valley Communications Council(MVCC) in Centerville, Ohio is a municipal communications and technology organization that represents eight member cities in the area, and holds affiliate agreements with 23other Miami Valley cities. Upgrading its master control and playout infrastructure to high definition while replacing decade-old legacy equipment, the council selected the Cablecast Community Media Platform from Tightrope Media Systems as the foundation of its enhanced operations. television channels, and lead intergovernmental projects designed to strengthen communications between member cities and their citizens. The council operates four PEG channels –two government channels, one educational access channel and one public access channel –while offering state-of-the-art production facilities, equipment and training to residents of its member cities. 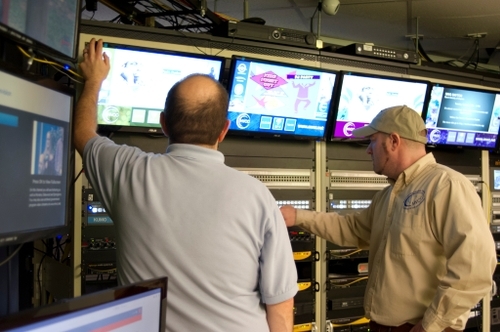 MVCC purchased the Cablecast Broadcast Automation software and two quad-channel Cablecast Flex 4 playout servers, configured to provide one recording input and one playout pathway for each of the council’s four cable channels. A Cablecast Pro VOD server automatically creates on-demand clips of the station’s programs, which are then delivered to viewers through the cloud-based Cablecast Reflect service. Four Tightrope Carousel systems drive independent bulletin boards on each channel. Supplied by systems integrator iVideo Technologies (known at the time as Industrial Video), the new installation went live atMVCC in September 2018. MVCC is pleased to announce that the MVCC Executive Search Committee has selected Jay Weiskircher to move forward as the new MVCC Executive Director, he will begin employment on Monday, January 7th. Jay has a wealth of experience in local government and will be a great asset to MVCC. Please join us in giving Jay a very warm MVCC welcome! SANTA ARRIVES Tonight at MVCC ! Join Santa, the Elves and MVCC Staff for Santa Call in 2018, view Santa live on MVCC channels 991 and 6, in Dayton on Channel 5 and on ATT Uverse Channel 99.